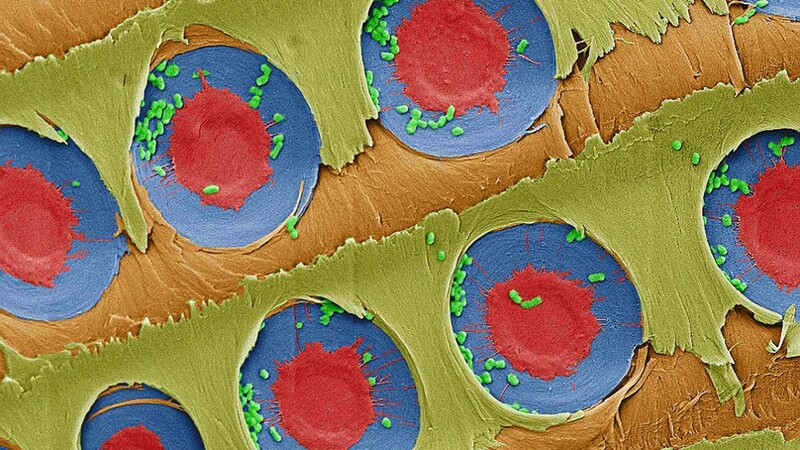 A false-color electron microscope image showing E. coli bacteria (green) trapped over xylem pit membranes (red and blue) in the sapwood after filtration. Image courtesy of the MIT researchers. MIT News: MIT group shows xylem tissue in sapwood can filter bacteria from contaminated water. In fact, an MIT team has discovered that this low-tech filtration system can produce up to four litres of drinking water a day — enough to quench the thirst of a typical person. In a paper published this week in the journal PLoS ONE, the researchers demonstrate that a small piece of sapwood can filter out more than 99 percent of the bacteria E. coli from water. They say the size of the pores in sapwood — which contains xylem tissue evolved to transport sap up the length of a tree — also allows water through while blocking most types of bacteria. Co-author Rohit Karnik, an associate professor of mechanical engineering at MIT, says sapwood is a promising, low-cost, and efficient material for water filtration, particularly for rural communities where more advanced filtration systems are not readily accessible. The paper’s co-authors include Michael Boutilier and Jongho Lee from MIT, Valerie Chambers from Fletcher-Maynard Academy in Cambridge, Mass., and Varsha Venkatesh from Jericho High School in Jericho, N.Y. There are a number of water-purification technologies on the market today, although many come with drawbacks: Systems that rely on chlorine treatment work well at large scales, but are expensive. Boiling water to remove contaminants requires a great deal of fuel to heat the water. Membrane-based filters, while able to remove microbes, are expensive, require a pump, and can become easily clogged. Before experimenting with contaminated water, the group used water mixed with red ink particles ranging from 70 to 500 nanometers in size. After all the liquid passed through, the researchers sliced the sapwood in half lengthwise, and observed that much of the red dye was contained within the very top layers of the wood, while the filtrate, or filtered water, was clear. This experiment showed that sapwood is naturally able to filter out particles bigger than about 70 nanometers. However, in another experiment, the team found that sapwood was unable to separate out 20-nanometer particles from water, suggesting that there is a limit to the size of particles coniferous sapwood can filter. Finally, the team flowed inactivated, E. coli-contaminated water through the wood filter. When they examined the xylem under a fluorescent microscope, they saw that bacteria had accumulated around pit membranes in the first few millimeters of the wood. Counting the bacterial cells in the filtered water, the researchers found that the sapwood was able to filter out more than 99 percent of E. coli from water. Karnik says sapwood likely can filter most types of bacteria, the smallest of which measure about 200 nanometers. However, the filter probably cannot trap most viruses, which are much smaller in size. Karnik says his group now plans to evaluate the filtering potential of other types of sapwood. In general, flowering trees have smaller pores than coniferous trees, suggesting that they may be able to filter out even smaller particles. However, vessels in flowering trees tend to be much longer, which may be less practical for designing a compact water filter. Designers interested in using sapwood as a filtering material will also have to find ways to keep the wood damp, or to dry it while retaining the xylem function. In other experiments with dried sapwood, Karnik found that water either did not flow through well, or flowed through cracks, but did not filter out contaminants. While the pores in sapwood are too big to filter out salts, Saurya Prakash, an assistant professor of mechanical engineering at Ohio State University, says the design could be useful in parts of the world where people collect surface water, which can be polluted with fine dust and particles of decaying plant and animal matter. Most of this detritus, Prakash says, could easily be filtered out by the group’s design. This research was supported by the James H. Ferry Jr. Fund for Innovation in Research Education.